Occator Crater, some 57 miles across and home of Ceres’ intriguing brightest areas, is prominently featured in this image from NASA’s Dawn spacecraft. Click the picture for a full-size version. Image credit: NASA/JPL-Caltech/UCLA/MPS/DLR/IDA. The brightest area on Ceres stands out amid shadowy, cratered terrain in a dramatic new view from NASA’s Dawn spacecraft, taken as it looked off to the side of the dwarf planet. Dawn snapped this image on 16 October, from its fifth science orbit, in which the angle of the Sun was different from that in previous orbits. 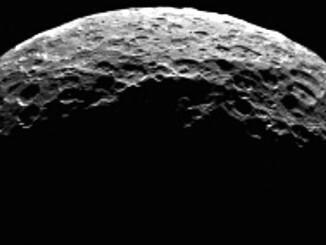 Dawn was about 920 miles (1,480 kilometres) above Ceres when this image was taken — an altitude the spacecraft had reached in early October. Occator Crater, with its central bright region and secondary, less-reflective areas, appears quite prominent near the limb, or edge, of Ceres. At 57 miles (92 kilometres) wide and 2½ miles (4 kilometres) deep, Occator displays evidence of recent geologic activity. The latest research suggests that the bright material in this crater is comprised of salts left behind after a briny liquid emerged from below, froze and then sublimated, meaning it turned from ice into vapour. The impact that formed the crater millions of years ago unearthed material that blanketed the area outside the crater, and may have triggered the upwelling of salty liquid. “This image captures the wonder of soaring above this fascinating, unique world that Dawn is the first to explore,” said Marc Rayman, Dawn’s chief engineer and mission director, based at NASA’s Jet Propulsion Laboratory, Pasadena, California. Dawn scientists also have released an image of Ceres that approximates how the dwarf planet’s colours would appear to the human eye. This view, produced by the German Aerospace Center in Berlin, combines images taken from Dawn’s first science orbit in 2015, using the framing camera’s red, green and blue filters. The colour was calculated based on the way Ceres reflects different wavelengths of light. 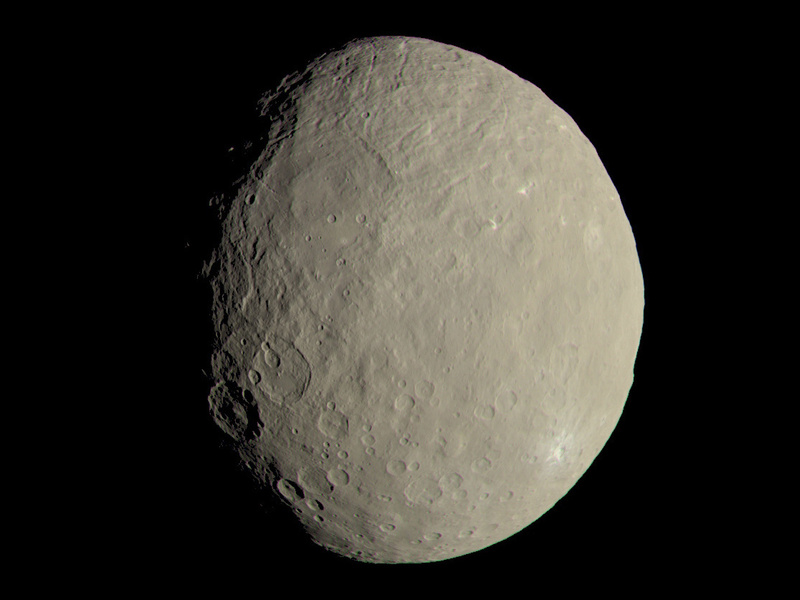 This image of 587-mile-wide Ceres approximates how the dwarf planet’s colours would appear to the eye. Image credit: NASA/JPL-Caltech/UCLA/MPS/DLR/IDA. The spacecraft has gathered tens of thousands of images and other information from Ceres since arriving in orbit on 6 March 2015. After spending more than eight months studying Ceres at an altitude of about 240 miles (385 kilometres), closer than the International Space Station is to Earth, Dawn headed for a higher vantage point in August. In October, while the spacecraft was at its 920-mile altitude, it returned images and other valuable insights about Ceres. On 4 November, Dawn began making its way to a sixth science orbit, which will be over 4,500 miles (7,200 kilometres) from Ceres. While Dawn needed to make several changes in its direction while spiralling between most previous orbits at Ceres, engineers have figured out a way for the spacecraft to arrive at this next orbit while the ion engine thrusts in the same direction that Dawn is already going. This uses less hydrazine and xenon fuel than Dawn’s normal spiral manoeuvres. Dawn should reach this next orbit in early December. One goal of Dawn’s sixth science orbit is to refine previously collected measurements. The spacecraft’s gamma-ray and neutron spectrometer, which has been investigating the composition of Ceres’ surface, will characterise the radiation from cosmic rays unrelated to Ceres. This will allow scientists to subtract “noise” from measurements of Ceres, making the information more precise. The spacecraft is healthy as it continues to operate in its extended mission phase, which began in July. During the primary mission, Dawn orbited and accomplished all of its original objectives at Ceres and protoplanet Vesta, which the spacecraft visited from July 2011 to September 2012. Magnitude +7.9 dwarf planet Ceres (α=01h 38m, δ=-1.5°) is well placed for observation, currently highest in the UK sky around 9:30pm GMT where its altitude is close to 35 degrees in the south for the centre of the British Isles. Magnitude +8.5 asteroid Melpomene (α=02h 04m, δ=-7.8°) lies just 9 degrees away from Ceres; note that both objects will appear starlike in binoculars and telescopes. Magnitude +5.7 planet Uranus (α=01h 19m, δ=+7.6°) is somewhat easier to locate, some 10 degrees from Ceres. This chart shows stars to the sixth magnitude and the view is 45 degrees wide — roughly twice the span of an outstretched hand at arm’s length for scale. Current date and epoch for equatorial coordinates. AN graphic by Ade Ashford. 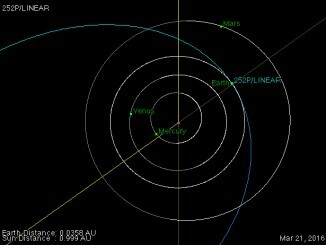 Comet 252P/LINEAR will zip past Earth on Monday, 21 March at a range of about 3.3 million miles. The following day, comet P/2016 BA14 will safely fly by our planet at a distance of about 2.2 million miles, or nine times the distance to the Moon. This will be the second closest flyby of a comet in recorded history next to comet D/1770 L1 (Lexell) in 1770. In this image from NASA’s Cassini spacecraft we see a crater duo on Saturn’s 698-mile-wide moon Dione. The upper of the pair, named Italus, is overprinted on a grouping of ancient troughs called Petelia Fossae. The lower crater, Caieta, sits atop a feature named Helorus Fossa. 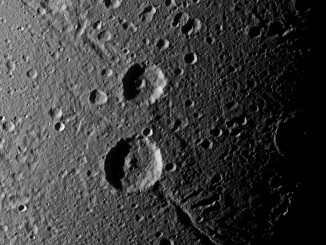 Fossae on Dione are believed to be tectonic features. 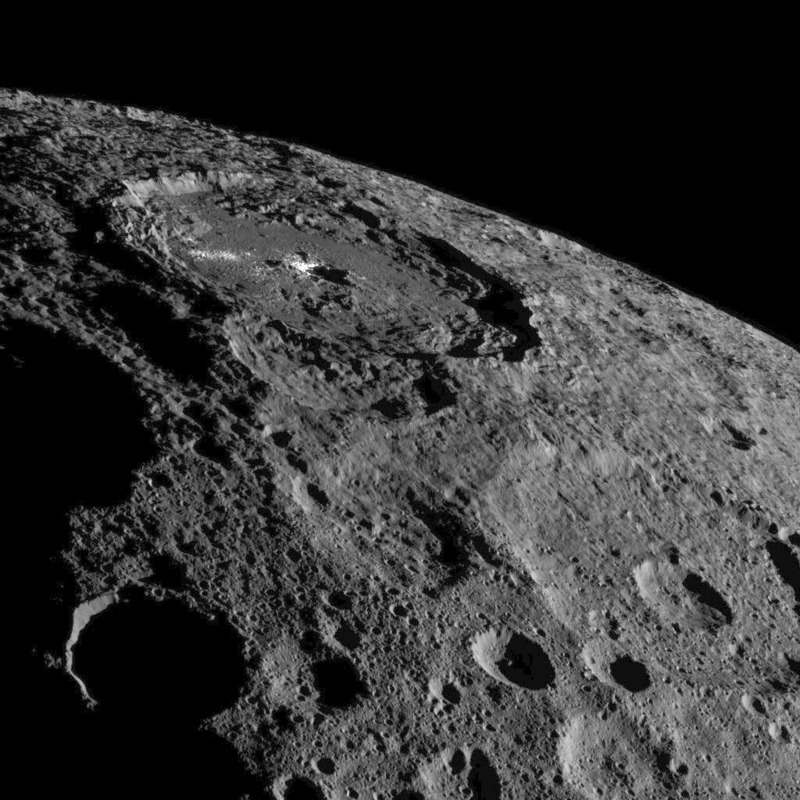 Having spent more than a month orbiting on the dark side of dwarf planet Ceres, NASA’s Dawn spacecraft has returned the highest-resolution views to date of this intriguing world’s sunlit north pole.